A horse death was reported Thursday at Santa Anita Park, the 22nd in a string of fatalities since December at the historic track northeast of Los Angeles. The death was confirmed by the park, which reopened for limited training Monday after a week-long closure was ordered after the 21st horse death since December. The track was inspected during the closure and soil samples were analyzed. Princess Lili B, a 3-year-old filly, broke both front legs during a morning workout. She was later euthanized. The park issued an open letter about the future of horse racing in California Thursday afternoon, calling the events at Santa Anita "heartbreaking." In the letter, Belinda Stronach, chair and president of the Stronach Group, said a group of experts will regularly review the tracks and announced a zero-tolerance policy for race day medication at Santa Anita and Golden Gate Fields in the Bay Area. "It is unacceptable to the public and, as people who deeply love horses, to everyone at The Stronach Group and Santa Anita," Stronach said in the statement. "The sport of horse racing is the last great sporting legacy platform to be modernized. If we expect our sport to grow for future generations, we must raise our standards." Between December and February of the previous year, 10 horses died at Santa Anita, compared with eight in 2016-17 and 14 in 2015-16. The track averaged about 50 deaths per year from 2008-18, according to data from the California Horse Racing Board. The unusually large amount of rain that has fallen over the Southland this winter has been mentioned as a possible factor in explaining the surge in deaths. Santa Anita officials are targeting March 22 as the date to resume racing at the famed track. 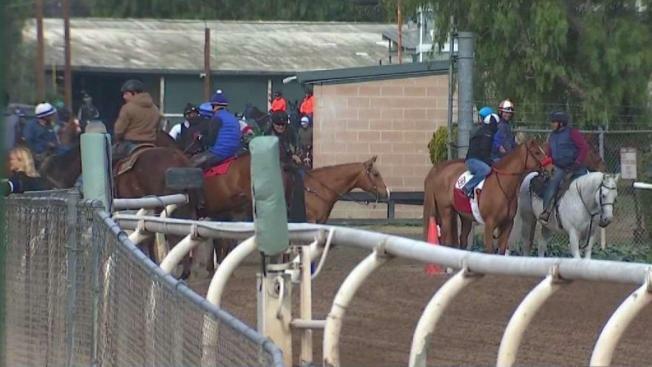 The main track at Santa Anita Park was open for limited training Monday morning, but it remains closed for racing indefinitely as officials work on implementing a series of safety protocols announced in the aftermath of 21 horse deaths at the facility since Dec. 26. Tim Ritvo, chief operating officer for Santa Anita owner The Stronach Group, confirmed the hoped-for March 22 re-opening date to the Daily Racing Forum over the weekend. "Regrettably, injuries occur in every sport, and horse racing, where hundreds of races take place every day around the world, is not immune. Santa Anita has taken industry-leading safety measures to prevent injuries and ensure our equine athletes are provided a safe and healthy environment in which to compete. "At The Stronach Group, we love horses and we are in this sport because we love horses. We are and will continue to take steps necessary to ensure the health and well-being of all of our athletes, equine and human." The creation of an equine-welfare position. Trainers who want to put a horse through timed, high-speed training exercises will be required to ask for permission 24 hours in advance. Officials said the move will help track veterinarians identify "at-risk" horses by evaluating past performance, workout data and physical inspections. The track has hired additional veterinarians "to observe all horses entering and exiting the tracks each morning during training hours." The track is also instituting a "House Rule" requiring "complete transparency with regard to veterinary records," requiring that the records follow the horse through changes in trainers or owners. Santa Anita also created the position of Director of Equine Welfare, which will be filled by an accredited veterinarian. The position will oversee "all aspects of equine well-being and will lead a Rapid Response team for injuries." That team will investigate all factors contributing to the injury and share its findings with the public, track officials said.